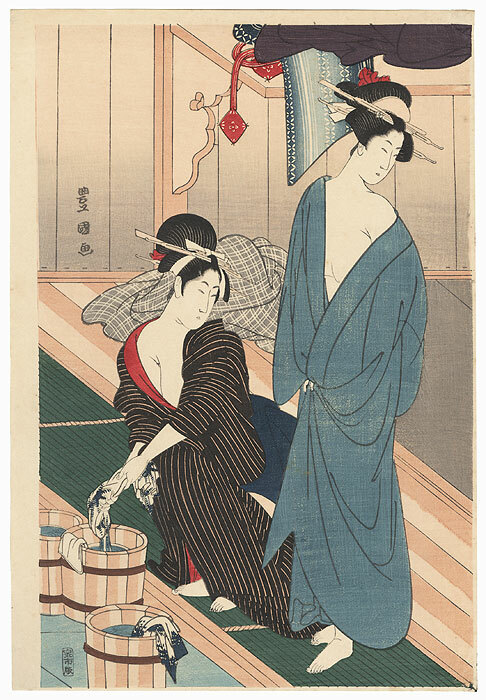 Comments - Charming image of two beauties at a bathhouse, one wringing out a blue and white cloth as she crouches beside a wooden pail of water. 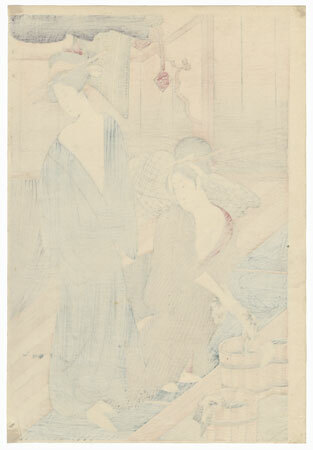 The other woman has a blue kimono loosely wrapped about her. A plaid robe lies on the floor behind the pair, and a shelf at upper right holds other articles of clothing. A handsome design, nicely composed. The first time we've offered this subject in reprint. Condition - This print with excellent color and detail as shown. Slight paper remnants on reverse at corners from previous mounting. Small tear and crease at edge, repaired. Slight toning, small spot. Please see photos for details. Good overall.